Heating up the Holidays with Carolyn Jewel! The Jewel household is an odd mix of "bah-humbug to the holidays" and "We STILL don't have enough holiday cookies to give out!" I'm going to blame my sister for the household rule, carried over, it would seem, to other Jewel sibling households, that no holiday decorations or other preparations are allowed until after Thanksgiving (In the US). For that reason, by the way, I feel oddly guilty writing to you about the holidays now. I'm not kidding, I'm sitting here thinking, "if my sister finds out about this, I'm in big trouble." Now I'm laughing, of course, because my sister is not only the sappiest holiday-lover in the world, but my biggest fan. She's already read my holiday anthology. That's the power of family traditions. I've never thought of us as a family with strong traditions, but as I think about it, that's not actually true. Our traditions are big and small and most of them crept up on us unaware that a tradition was forming. The holiday meals tend to vary greatly depending on who is cooking. One year my brother the chef enlisted us as his kitchen help. The food that year was sublime. (We had pheasant, turducken, and turkey). If we're cooking at my parent's house, we have dry turkey because my mother and father have very different opinions about oven temperatures. My dad walks through the kitchen and turns up the oven. A little later, my mom comes in and turns it down. And so it goes until the turkey is terrible. But we still have sweet pickles on the table, and homemade pumpkin pie and cranberry relish and nobody really cares that the turkey is horribly dry. When the kids were younger, we decided we would only buy gifts for the various nephews and nieces. To fill the gift-gap we started a gift exchange. Everyone participates. All but one of my siblings live within 25 miles of our parents, and he's still in California, so gathering for the the holidays is not as complicated as it could be. We figure out when travel and visiting schedules mesh--one of my bothers is married to a Danish woman so they switch off holidays between the US and Denmark, and pick a time when we can get together. For our gift exchange we each buy one gift not to exceed $15.00 and then do a round-robin choose a gift or steal someone else's. It turns out it's loads of fun. From the youngest to the eldest, we are all vicious gift stealers. It's astonishing, really, how much satisfaction and enjoyment is had from stealing a $15.00 gift. Like sweet pickles on the tables, the gift exchange is now a tradition. To one random commenter, I'll offer up A Notorious Ruin and My Darkest Passion, international OK, winners choice as to digital or print, and a $25 iTunes gift card to anyone in the US. Readers, please indicate in your comment if you are in the US or International so that we can put you in the correct giveaway. 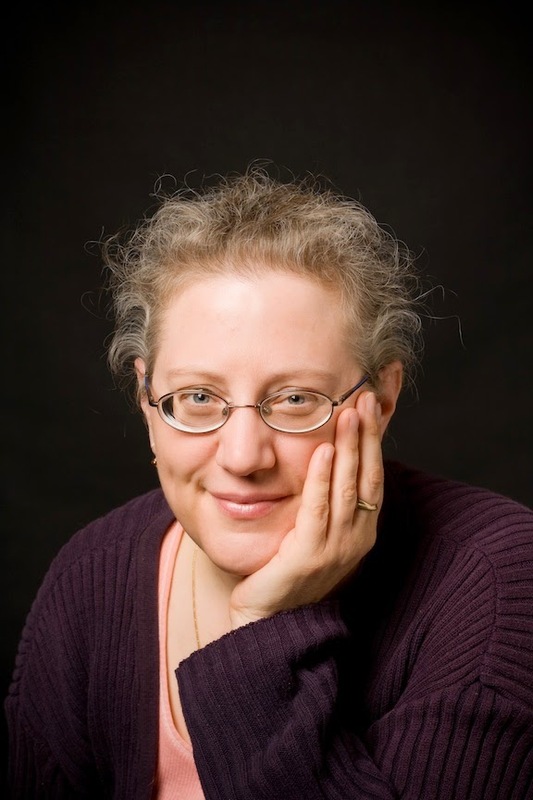 Carolyn is also hosting a giveaway for her newsletter subscribers. Sign up at the link below. 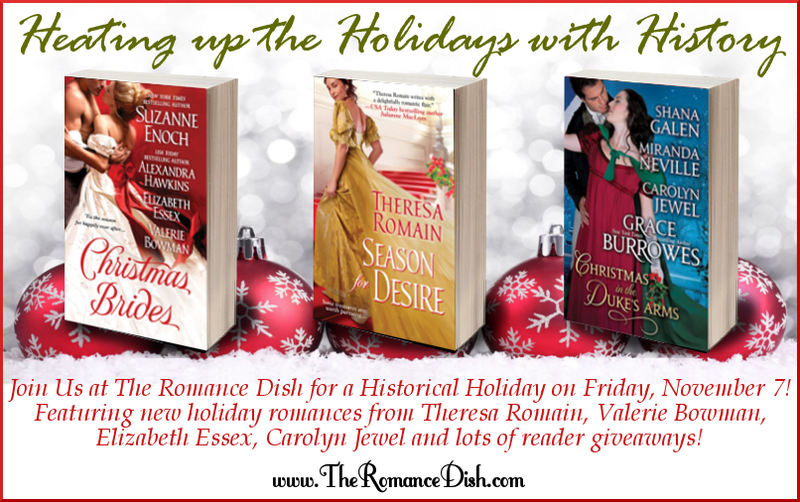 Don't forget to like the Romance Dish Facebook page for a chance at the bonus giveaway from today's authors! Whoo-Hoo! OK, I had to switch browsers. PJ. Thank you for your comment. I'm so glad you enjoyed the post. The various Jewel Centrals are a bit snarky, but it's always fun! I laughed out loud at the turkey temperature control battle. It resurrected memories of a particular Thanksgiving when I was recovering from gallbladder surgery and my nephew and stepmom (nephew's grandmother) "shared" cooking duties. Let's just say they were not of "like minds" and the scenario as it played out during the day was hysterical! My kids pick out an ornament every year for our tree. They are now 17 and 14. I have an ornament for every year since their first Christmas. I think I will still have them buy an ornament for my tree even after they leave home. That's a wonderful tradition. It makes the ornaments extra special because of the memories. I think you should continue it. Hi Carolyn. We have a large family feast with latkes, applesauce, apple cake, salads, and then cute pressies for the grandkids who are enjoying Chanukah and love the holiday. Ooh, latkes. Do you have a good recipe? And I notice you mention apple cake. I love cake. Cake is almost my favorite food. I zeroed right in on that apple cake too, Carolyn. Do you have a recipe you'd be willing to share, traveler? US! Loved the post. Your family has great traditions and I like how your family does the gift exchange. LOL! We did a gift exchange with the extended family when I was a kid but I think the way you do it would have been much more fun! Hi, Carolyn! Like PJ, I laughed out loud when I read this post. It sounds so much like my Sicilian relatives making ravioli for Christmas. There is ONE right way to do it and EVERYONE knows it--but somehow everyone's "right way" is different. Once it's done, though, everyone agrees it's delicious. Your traditions sounds wonderful. Loved your post. US. We have a beautiful family gettogether which consists of elaborate and delectable foods, storytelling which is captivating and gifts for all which are sometimes handmade or homemade goodies. Nothing more special (in my opinion) than hand/home made gifts. Ooh, storytelling! That sounds lovely. This is making me wish the holidays were even closer! Sorry forgot. US. Apple cake is a big tradition, easy and very delicious. Will you share the recipe, traveler? My grandmother made a delicious apple cake (one of my favorite childhood treats) but nobody kept her recipe. I'd love to have a family-tested one! Yes, I'd love some recipes. I love to bake, and I'm always looking for something new to try, I don't think I've made apple cake before. Hi, Carolyn! 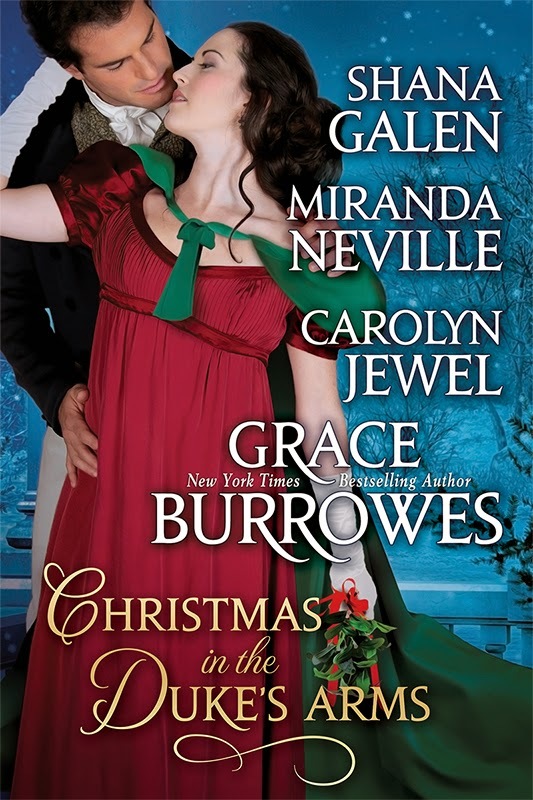 I look forward to reading Christmas in the Duke's Arms. One of my favorite family traditions arrived via a sister-in-law. When she joined our family, she gave us each a hand-knit Christmas stocking. The tradition is that we fill the stockings with little wrapped presents. They can be fun or practical or food items (candy!) - anything goes! On Christmas morning, we go down to our family room and open our stocking presents. Then we sit down to a special hot breakfast. Only after we've finished breakfast do we go out to the living room tree and open the "big" presents. It's a lot of fun to see how creative someone can get with wrapping something for the stocking. And it slows the morning so that we can thoroughly enjoy our family time together. Oh, a hand-knit stocking! That is SO AWESOME! Also, I love wrapping presents. Love it. I budget for expensive wrapping paper and ribbon every year so I have do crafty gift wrapping. I love this tradition, Judy. Christmas morning flies by so quickly. It's nice to have a tradition that slows things down so that we take the time to truly appreciate everything. I have a large handmade stocking that I fill with small wrapped gifts and hang on the inside of my front door. Everyone who visits me during the month of December gets to take a gift from the stocking when they leave. It's my little way of thanking them for stopping by to brighten my day. Heading for your house this year! That's such a cute thing to do! PJ, that is a sweet tradition as well. Hi Carolyn. Did you know the gift exchange is called a Yankee Swap? At least it is in New England where we are cheap (to heck with $15 - $10 is plenty) and we have snow, unlike you Californians. My daughter and I eagerly await the appearance of Christmas trees - more than one to accommodate our giant ornament collection. I am not a big holiday person but I do like my tree(s). Hi Miranda! I've heard it called a Chinese gift swap too. Whatever it's called, it's usually a lot of fun! I'd never heard that called a Yankee Swap before, but I suppose that makes sense. Here in my part of Nor Cal, we probably need the higher gift limit. My sister and my son have a tradition of picking out the tree every year. As he got taller, so did the trees. I'm so sorry you've having trouble with the comments, Carolyn! We don't don't exchange with extended family. We make cookies, I make chocolates and fudge. We always read A Visit From St Nicholas on Christmas Eve. The kids get a new ornament each year- -I have bins for each. They'll have ornaments when they move out. Lol. I make cookies and chocolates. Brother #1 is the family fudge maker. He uses my late grandmother's recipe. It's a Christmas package I look forward to getting each year! Oh, fudge. I'm getting hungry just thinking about it! Your kids are going to love having a supply to ornaments to get them started off. What a great idea! We set up our tree the day after Thanksgiving and decorate it after Mass. I bake cookies for a neighborhood swap and send out Christmas cards. The past two years I haven't succeeded in getting my Christmas cards out on time. I'm determined to change that this year! Susan: Yes, I also enjoy looking at favorite tree decorations. They all have memories associated with them. A neighborhood cookie swap sounds great! Our closest neighbor is an amazing, amazing baker, and she sends over a holiday supply tray of cookies and fruit cake that will make you want to walk to her house and demand more. It's the best fruit cake ever in the entire world. Baking neighbors rock. Hi Carolyn! We call that gift swap Dirty Santa here in Georgia. Some of our traditions when our boys were growing up were starting our Christmas decorating right after we did the Thanksgiving dishes. We would play the first Christmas song, "Merry Christmas Darling" by the Carpenters while we brought in all the boxes of decorations. And we decorated everything that didn't move! Then they got to open one present on Christmas Eve. I sure miss those days when I had small children. It was such a magical time. Those are lovely traditions, Angie. When we were children our parents would let us open one gift (of their choice) after Christmas Eve church services. It was usually new pajamas which would entice us to quickly change and jump into bed to await Santa. Angle-la: I know!! I miss the young kids, too. It is a wonderful time when they believe and are just so wide-eyed at the thrill. And I love your decorating tradition. That sounds like great fun! I'm so glad you enjoyed Lord Ruin! I hope you feel the same about A Notorious Ruin. I have not written Mary's story yet, so, nope, you have not missed it. I will write it, though! Thanks for stopping by. I love you. You are my favorite. ;-) Thank you for such kind words! The stories in Christmas in the Duke's Arms are all so wonderful! It's a great collection of stories. I hope you enjoy them! I laughed too, Carolyn. Your sister sounds great! Thanks! She is pretty great. Carolyn, thanks so much for hanging out with us this evening! I'll be looking forward to reading In the Duke's Arms! Thanks! It was fun hanging out with you! We always have pickles and olives on the table too. And we always have some form of cranberries--I prefer the canned jellied kind--but Mom usually likes to do something with real cranberries. I used to always go out with my Dad and find a Christmas tree in the woods, but they finally got an artificial tree that we use now. On Christmas Eve our family has two different traditions we have had each year since our first son was born and no matter their ages we still have with our sons and their families (which includes 4 grandchildren). The first tradition is the youngest person present on Christmas Eve puts the star on top of the Christmas tree and the second is that my husband reads Twas the Night Before Christmas to everyone. The family is now spread out and living in different states but Skype has let us be able to continue the tradition to include all our family members both bear a far away! There's always a surfeit of good food during the holidays & we suffer for indulging too much after but no one complains! I'm in charge of the sweets - cookies, cakes & jelly.